For 2010, all engines but the base 4.3-liter V6 come with flex-fuel capability. A 3.08:1 axle ratio and fuel saver mode is standard with the 5.3-liter V8 for improved fuel economy. Variable valve timing on the 4.8-liter and 5.3-liter engines improves fuel economy. A six-speed automatic transmission is on Regular Cab and Extended Cab models with the 5.3-liter V8. Side-curtain airbags and seat-mounted side airbags, and the StabiliTrak electronic stability control system, are standard on all models. The 2010 Chevrolet Silverado 1500 Regular Cab is powered by a base 4.3-liter V6 with 195 hp. Other available engines include a 4.8-liter V8 with 302 hp and a 5.3-liter V8 with 315 hp. 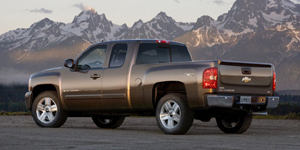 The 2010 Chevrolet Silverado 1500 Extended Cab is powered by a base 4.3-liter V6 with 195 hp. Other available engines include a 4.8-liter V8 with 302 hp, a 5.3-liter V8 with 315 hp and a 6.2-liter V8 with 403 hp. The 2010 Chevrolet Silverado 1500 Crew Cab is powered by a base 4.8-liter V8 with 302 hp. Other available engines include a 5.3-liter V8 with 315 hp and a 6.2-liter V8 with 403 hp. The 2010 Chevrolet Silverado 1500 Hybrid is powered by a 6.0-liter V8 with 332 hp. Find the used Chevrolet Silverado 1500 of your choice from a dealer in your area. Search our used car listings now.